Voted the best Romanian city to live in, over 400,000 people call Cluj-Napoca home. This dynamic, multicultural city is aspiring to become European Capital of Culture in 2020. The Office connects you with a highly qualified workforce - without a doubt, one of the city’s most important assets. With more than 100,000 students, Cluj-Napoca is a vibrant university centre whose future rests on IT&C, engineering, financial services and other innovative industries. Infrastructure development, the preservation of a rich cultural heritage, together with environmental sustainability, are top priorities for Cluj-Napoca. This city is an attractive destination for multinational companies focusing on software development, financial services, near-shoring business process outsourcing, industrial production or logistics. It is emerging as an important service hub due to its highly skilled and multi-lingual workforce. 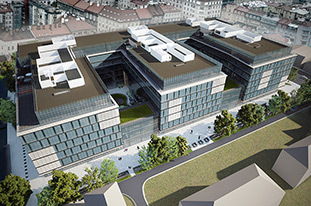 Accessible costs and an excellent geographical location have prompted consultancy companies to place Cluj-Napoca among the world’s top destinations for IT investment, highlighting the city’s successful strategy in this field.